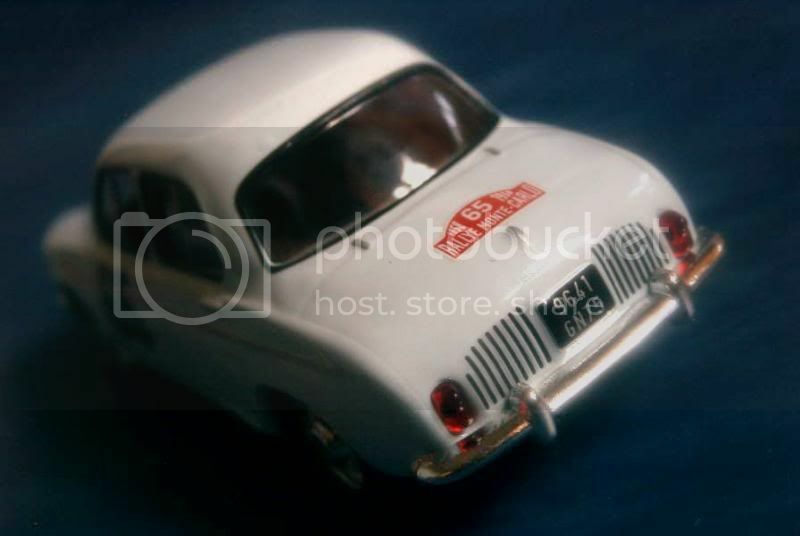 Not a single new car sold during five years of conflict and the possibility for a more prosperous working class of purchasing an automobile for the very first time combined to make the little Renault 4CV, launched in mid-1947, an instant hit. Obviously, its manufacturer started to think about its replacement as soon at it was put on the market but, as it turned out, its success was such that a direct substitute could not be imagined. 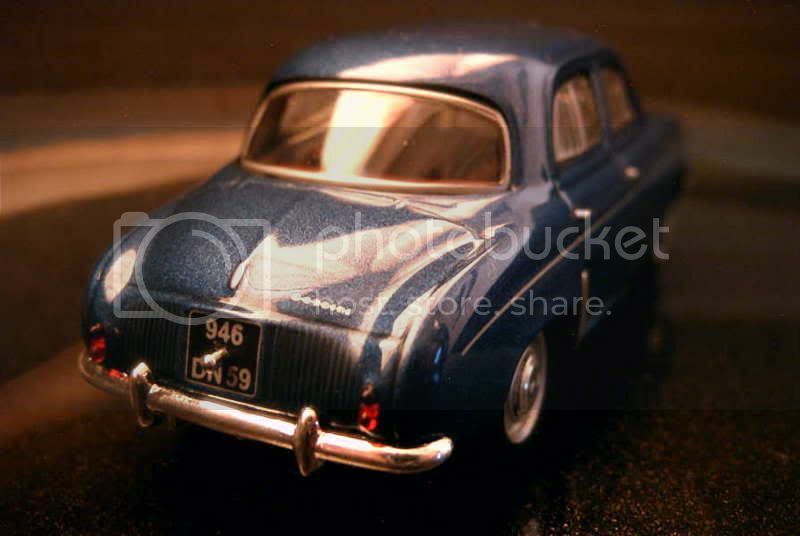 Therefore, a larger car ended up being sold alongside the 4CV, rather than it replaced it. The “Project 109” study started in earnest in July 1951. Ultimately, the car would become the Dauphine, placed between the 4CV and the Frégate, and addressing previous owners of 4CV whose improved way of life would allow purchasing a larger automobile, while the 4CV would continue to answer the needs of first-time motorists. Rarely the introduction of a new car had been so carefully prepared, the whole development lasting almost five years and including an in-depth study of the needs of the average French motorist. 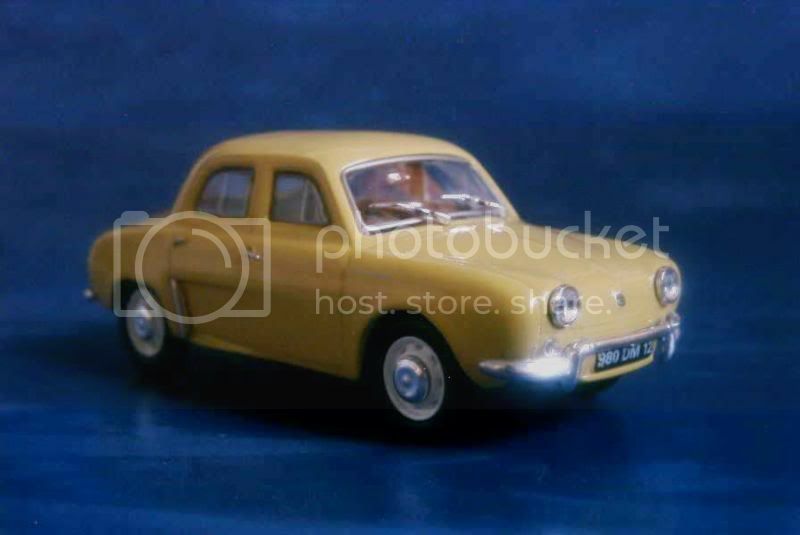 The presentation of the Renault Dauphine took place in February 1956 in Corsica, where many journalists had been invited to test the first new Renault in more than five years. The public would have to wait one more month for its introduction in Paris. Finally, the Dauphine was officially unveiled during the Geneva motor show. 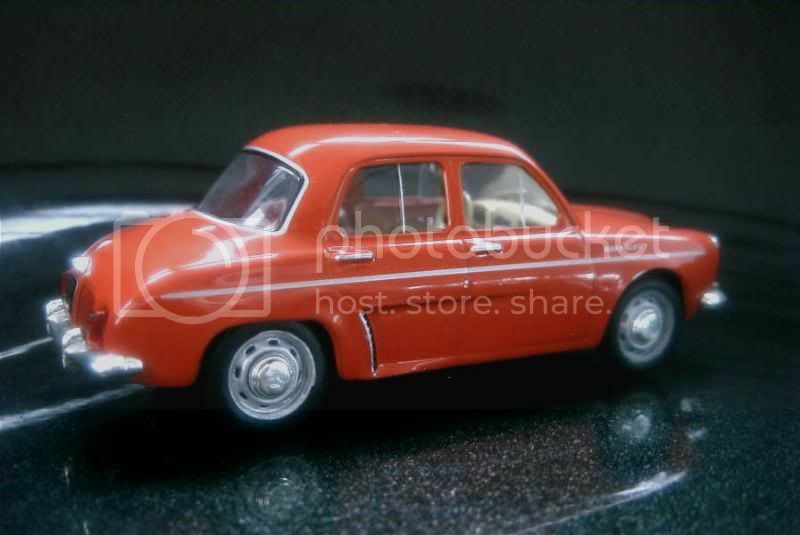 A box-type automobile of much larger proportions than the 4CV, the Dauphine retained a rear engine, but of larger displacement – 850cc for 27 hp. Handling was extremely sound for a car based on this architecture, the Dauphine only oversteering when pushed hard in tight turns. The front luggage compartment was rather vast for the times. And, to make things even better, the Dauphine, after the initial prototypes had been corrected by Ghia, was a very elegant automobile, offered in a variety of bright colours. As the 4CV before it, the Dauphine’s success was immediate and, ultimately, more than two millions were built until 1968, production continuing until 1970 in some countries. 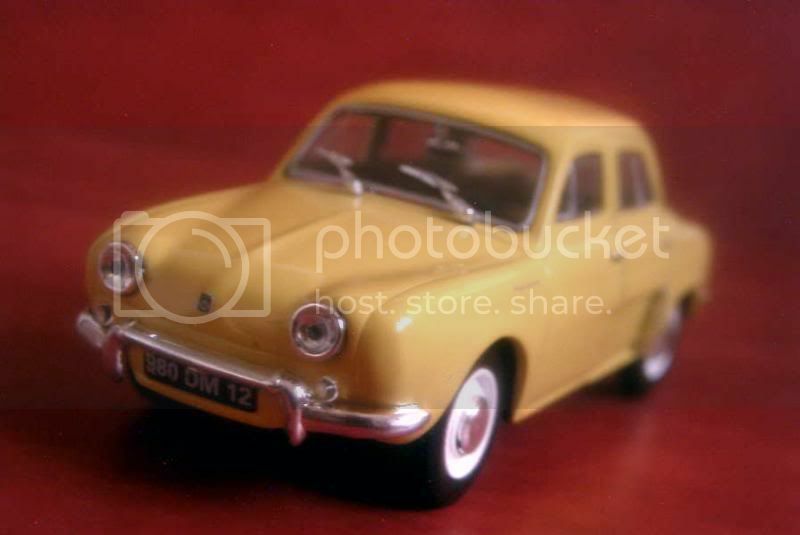 It, too, would survive its heir apparent, the Renault 8. Among the memorable variants of the original car, let’s name the Gordini from 1958, with its 38 hp engine; the Ondine, a better-appointed version introduced in 1960; and the R1093, a homologated racing development of the Dauphine fitted with a 55 hp engine and a four-speed transmission. Another noticeable equipment was the Ferlec electromagnetic clutch (optional from 1957) that turned the Dauphine’s manual transmission into a semi-automatic one. 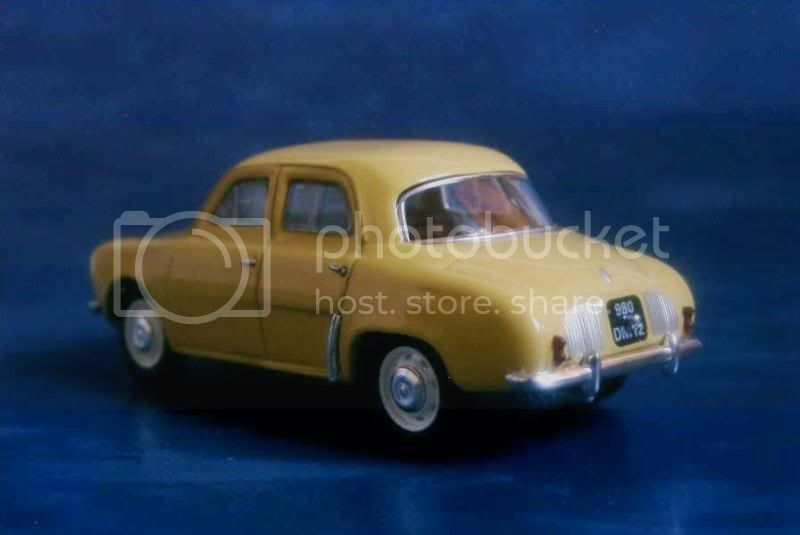 The excellent Dauphine engine was also fitted under the bonnets of such dissimilar vehicles as the Alpine A108 sports coupe or the Renault Estafette panel van. The outputs of the sporty versions’ perhaps seem ludicrous today, but the Gordini and the R1093 were quite effective machines back then, the Dauphine bagging a victory at the Monte Carlo rally, and two at the Tour de Corse, among countless minor trophies. More than its success in France, the Dauphine’s achievements around the globe were remarkable in a time when brand new cars seldom crossed borders. Apart from FASA, Renault’s Spanish subsidiary, the Dauphine was produced under licence by Alfa Romeo in Italy (easily forgotten today, but there has been thousands of Alfa Romeo Dauphines built! ), by Kaiser in Argentina and Israel, by Willys-Overland in Brazil and by the minor Todd Motors in New Zealand. It also served as the base for the Hino Contessa, after the Japanese company had produced the 4CV in the Fifties. Most notable of all, though it ultimately met with a bitter end, was the Dauphine’s great success on the American market. During the first large wave of imports that took place in the late Fifties, it was second only to the Volkswagen Beetle in terms of sales. Unlike the German car, the Dauphine offered four doors, a pretty silhouette and Parisian chic to American motorists. Alas, the Dauphine proved anything but durable on American highways, and suffered to the extreme from rust. To make things worse, Renault’s budding North American network was well below par to address the complaints of its disenchanted customers… When the “Big Three” unveiled their own compact cars, the Ford Falcon, the Chevrolet Corvair and the Plymouth Valiant, Renault ended up with thousands of Dauphines rusting in the open air in New York docks – most were finally shipped back to France at considerable expense. 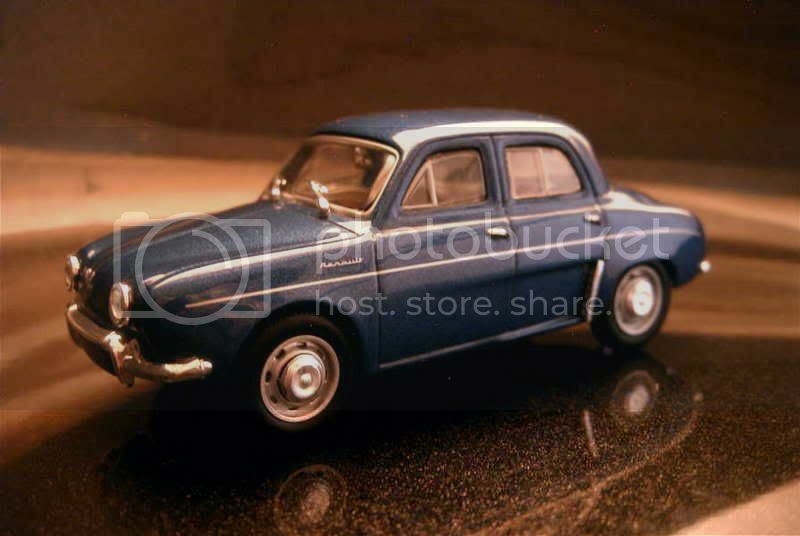 Distributed by: Norev, as part of a “Gordini” box set offered in the “Renault Gamme Sport” series. Acquired: second-hand as part of the complete set, offered by a friend and fellow collector in December 2006, in Manila, Philippines. Norev’s rendition of the Dauphine Gordini suffers mostly from the poorly designed door handles, which have the naughty habit of swinging freely around their attachment points. Apart from this detail, this model is rather nice, and deserves a 13/20. 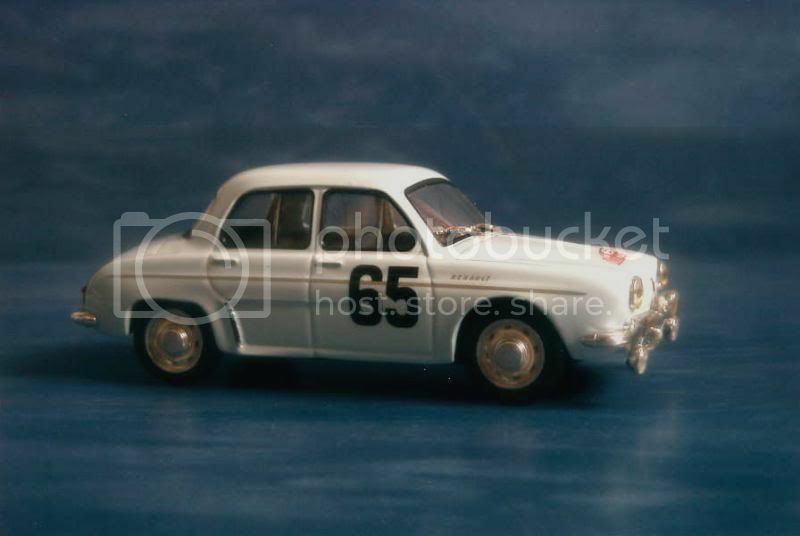 This particular one was part of a three-car commemorative “Gordini” set, which also included a Renault 8 Gordini and an already presented Renault 12 Gordini (curiously Norev omitted the Renault 17 Gordini…). We have briefly discussed about the Dauphine’s racing career. Though the car itself wasn’t particularly impressive, its historical victory in the Monte Carlo justified its inclusion in Altaya’s series of rally cars. 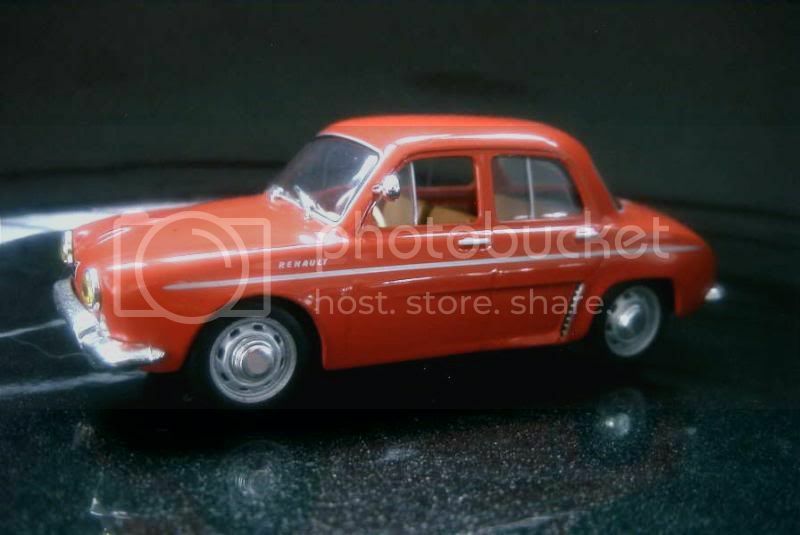 Unfortunately Ixo's model of the Dauphine is fitted with grossly oversized side windows. Too bad! My rating is 12/20. 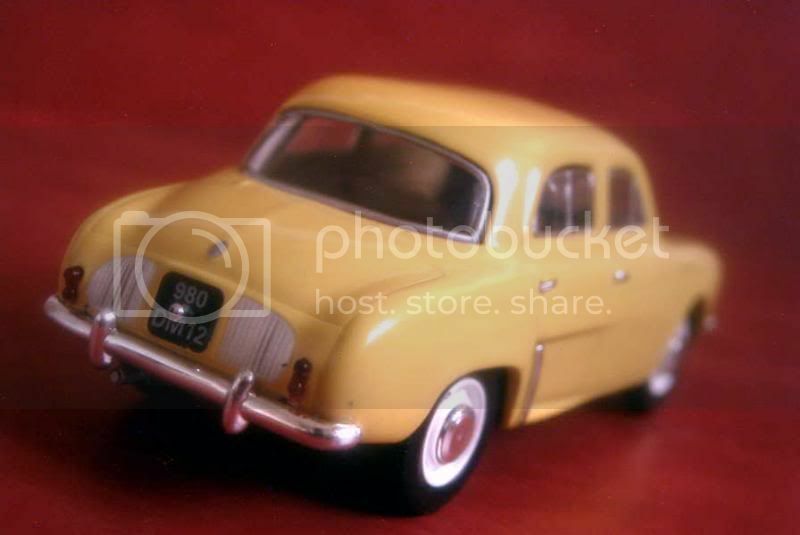 Remove the previous model’s few items that identify it as a racing car, and you get this plain Dauphine. In addition to the reproach already made above, Ixo painted its model into this bright orange that has never been a factory colour. This forces me to further lower my rating to 11/20. Same thing with Norev that provided a plain Dauphine for M6’s press series. It is based on the same mould as the Gordini we have seen above – and suffers from the very same flaw: 13/20. 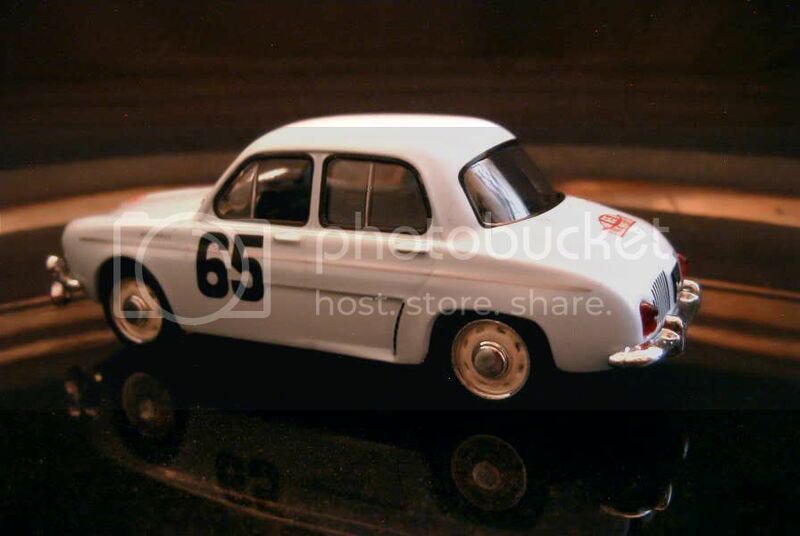 Hermoso los Dauphine; me gusta mucho el ganador del Rally de Montecarlo, miniatura que espero pronto poder sumar a mi colección. 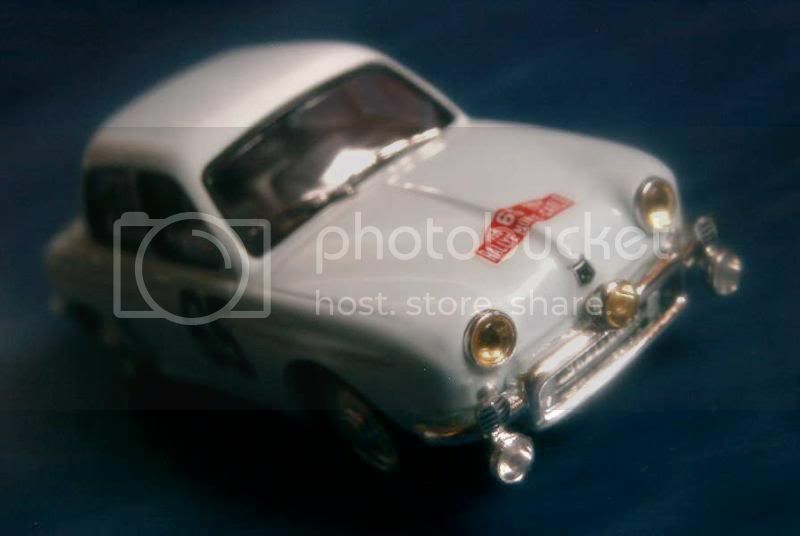 Beautiful the Dauphine; I really like the winner of the Monte Carlo Rally, thumbnail which I hope will soon be able to add to my collection. Glad you like, and hopefully you can find the Monte Carlo one quite soon. Regards! as you state in the blog, this car was produced in our country, it is a familiar , friendly, presence. as regards the models, I find the norev better designed than the ixo. You're definitely right, the Norev is much superior to the Ixo.